In the early 1990s, Jon Madin and Andy Rigby began what is now an international movement by adapting the marimba-making model Andy had learnt about in Botswana. Ever since then, playing marimbas, encouraging others to play them, and making them with school and community groups has been a big part of my life. Some of the instruments I have been using in schools recently were made in the early 1990s and are still going strong – with perhaps a few bars replaced over that time, and a bit of re-tuning every few years. What’s so magical about Marimbas? Lots of things! They are so big, you can make them yourself, they are made of lovely wood, they can be played by anyone, they always sound good, and you can play with your friends! Someone can play just a two note bass and others can add in other patterns and it will sound good. Or you can play more complicated things like the “Can Can” which is great fun. All levels, all ages. I just love the sound of a room full of marimbas booming away, whether it’s school kids or top-level musicians or a mix of all ages or beginner adults. Anyone can sound good on a marimba within ten minutes. With carefully selected pieces, even a new group of players can sound terrific in fifteen. Marimba playing = Immediate gratification! 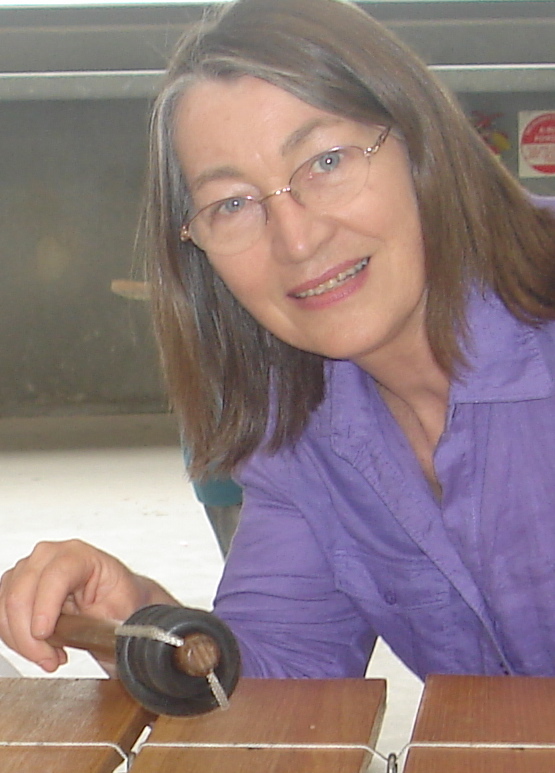 As a foundation to a classroom set of xylophones and other percussion, they have now become common in music programmes, especially in the Australian states where music specialists are regular members of staff in primary schools (Victoria, Queensland etc). Ideally they are the Jon Madin design and have been made by parents and children at the same school, for feelings of ownership and empowerment. Carl Orff, a German composer and music educator, inspired an approach to learning music that encouraged playing and singing as a group, integrating music and movement or dance, and used instruments that were easy to play. The set of instruments used in an Orff-inspired music programme is called the ‘instrumentarium’ and usually consists of ‘melodic percussion’ or barred instruments: xylophones (wooden bars), glockenspiels (the little high-pitched metal ones), and metallophones (larger, lower-pitched metal ones), Percussion instruments such as drums and wood blocks, and recorders, are also part of the ‘Orff Instrumentarium’. Marimbas are an ideal addition to this collection, and are common in primary schools around Victoria. One of the enormous bass marimbas added in gives great ‘oomph’ to the music and is always popular with students. The Victorian Orff Schulwerk Association (VOSA) runs lots of workshops and other events for teachers and other adults interested in music and/or working with children. Carl Orff also emphasized improvisation, and marimbas and percussion. are ideal for social interaction. The large size and physical nature of the marimbas make them appealing, especially to older students and adults, and they give a good bass to the other instruments. By combining a simple bass with a middle part which is not too difficult, and perhaps a more complex top part or melody which is fairly quick to learn, groups of novice musicians can be led to group music-making that is immediately satisfying. Jon Madin’s “Boris the Bassman” has been a great favourite for 20 years because it incorporates these elements. There are regular events where you can play marimbas. 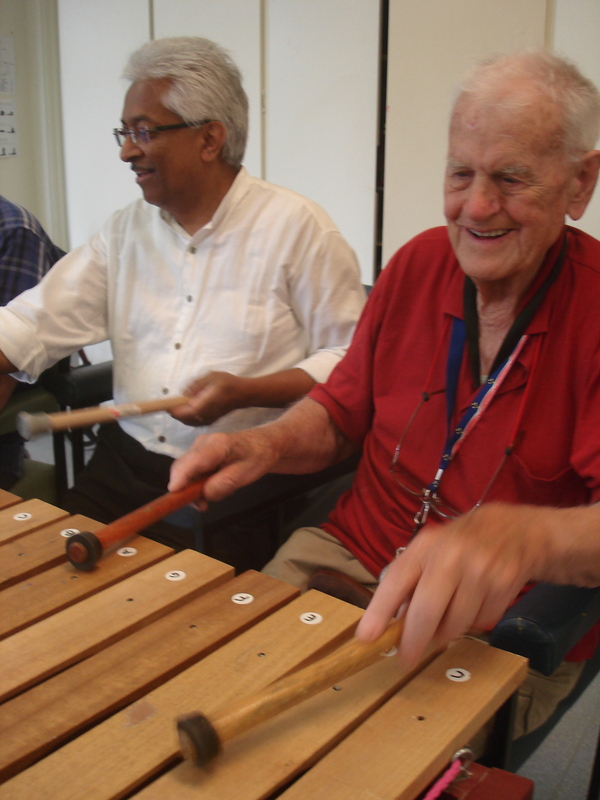 Weekends such as Community Music Victoria’s Treetops Music Camp, Turramurra Bush Music Camp, Roses Gap/Charnwood Folk Camp, and the monthly playing sessions in West Heidelberg (HeidyMarimba) all offer opportunities for everyone to try these instruments. You’ll see them at some festivals. Look out for Jon Madin and his marimbas (plus all those other surprising instruments such as Musical Bikes and DingBoxes). Andy Rigby may be there with some marimbas as well as harps or flutes of various types. The annual Melbourne Wood Show has a stand where you can see an instrument being made, and try them out. In Geelong, and at the Port Fairy Folk Festival, you may see the Tate Street Primary group playing. Maybe your local primary school has a couple. 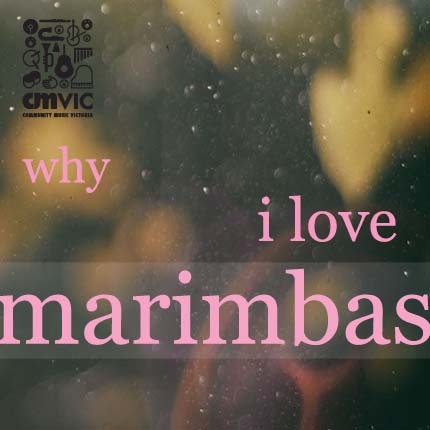 Marimbas are all around, especially in Victoria – hooray!